Crave-worthy Vegan Meals at S&.. The upcoming holiday season is a joyous time of year with family get-togethers, time with friends, office parties, and presents. But the season can also create a certain amount of stress. We really wonder if the items we gift will be loved…or hated. We know they’ll appreciate the thought of our giving, but we really want it to be special to them. Believe or not, he just may not like that sweater you gave him. Basically, in the gift giving world, you can give an item that, in your heart of hearts, you feel is ideal for your recipient, I mean you’ve shopped for hours and this item jumped out at you. You had this “Aha!” experience, “That’s it, that’s him”. Problem solved. But you just could be totally wrong, he would never let on but that item could end up going in the closet never to be seen again. We all usually have one person on our list that pretty much already has all that they need. Oh God, what to give them? You would be mortified if you gave them a “white elephant” gift they had absolutely no desire for. O.K., conversely, instead of that risky purchased item you could fork over cash or a check. That offers the maximum in flexibility and choice but is not very personal or endearing. It’s just plain cold — scratch that idea. Because there are hard-to-shop-for people, and because some givers just plain dread shopping, is why gift cards have gotten so popular in recent years. It gives the recipient a lot of choices as to how to spend the value given. Easy — you merely give them a gift card to their favorite restaurant or store and they can decide what to buy. Ooops, what if you don’t know their favorite restaurant or store? The ultimate answer lies with a gift card with total flexibility that can be used and a large number of shops and restaurants, the choices are then limitless. Your recipient will be in utter bliss having bought the perfect gift. 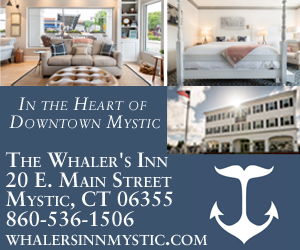 Earlier this year the Greater Mystic Chamber of Commerce launched the Mystic Go Local gift card and it is proving to be the “perfect gift”. As of this writing there over 70 participating businesses in Greater Mystic accepting the card. They range from Mystic Aquarium to the Fields of Fire Adventure Park, to our famous restaurants, to hair salons and scores of boutique shops, and the top hotels along the scenic Mystic River. Plus the card carries the aura of Mystic, I mean who doesn’t just love Mystic. So your recipient will think of you when she thinks of Mystic – kind of like Michael Jackson and Pepsi – you’ll be a hit. The inception of the Mystic Go Local gift card was made possible by a generous sponsorship by Olde Mistick Village. They had the vision to realize that this program is an ideal way for people to share the Mystic experience and we are most appreciative. Many of the merchants are offering exclusive discounts to buyers using the Mystic Go Local Gift Card and more are added each week. So, a $100 gift card will have buying power in excess of the face value. But isn’t it just as easy to give a Wal-Mart or Amazon gift card you may ask? Yes, both Amazon and Wal-Mart offer an infinite number of items to choose from, so flexibility and choice is definitely there. The Mystic Go Local gift card also gives the gift of Mystic. Your recipient can stroll the streets by the drawbridge shop for items, have a nice lunch or an ice cream at Mystic Drawbridge Ice Cream. So the items they purchased are gift wrapped with a delightful day in Mystic. So, would they rather shop in a Wal-Mart big box store or beautiful downtown Mystic? C’mon man! Another big reason for giving a Mystic Go Local card is to help the local Greater Mystic economy. You see, one person’s spending is another person’s income. When your recipient spends at one of our stores the money goes to that store owner. She in turn spends on items at other stores in the community, and so on. It’s called the multiplier effect. That’s why it is truly the gift that keeps on giving. Conversely when a person shops on Amazon with their Amazon gift card, that money goes to a bank account in Seattle. Wooosh, it leaves the area, bye, bye multiplier effect. Even though we’re about to enter the holiday season, the Mystic Go Local gift card can be used all year long. But it’s not limited to just birthdays and anniversaries. Perhaps you know of someone that is planning a trip to Mystic, the card makes for a great bon voyage gift. If you run a business, what a great thing to give to your “employee of the month”. Give your valentine a card and that she can have fun shopping at one of our jewelers you’ll be a hit. If you live out of the state of Connecticut and have someone you know about to graduate from any of our area colleges, what a great graduation present that will make. They can buy something functional, or have a great graduation meal at a restaurant, it’s their choice. The Groton navy base has a number of enlisted personnel that could truly get benefit from a Mystic Go Local gift card. You’re limited only by your imagination. “OK,” you say “I’m convinced, now where can I buy the Mystic Go Local gift card”? You have a couple of choices. If you reside in the area you can visit the Greater Mystic Chamber of Commerce’s Welcome Center and purchase directly. There is a slight handling charge in either case. In closing, please consider giving the gift that keeps on giving, the Mystic Go Local gift card. Happy holidays and happy gift giving. About the Author Al Valente lives in Mystic and is the Chairman of the Board of the Greater Mystic Chamber of Commerce and a contributor to This is Mystic.